More modern-day Anathema atmospherics than Doom, Iran's The Unknown deliver a polished debut. Want a serious challlenge in life? Well, consider being an Iranian Doom band - currently, the only one - where you're not even allowed to distribute your own CDs, but need to go through an Italian intermediary to get them to the outside world (I'm still waiting for my 'real' copy to trans-ship via that route, as it happens). Hard to imagine those kinds of restrictions? Well, welcome to Aria Moghaddam's world. Kudos, quite frankly, for making any effort at all to transgress those boundaries. And double kudos for making a pretty decent fist of it, musically, in the process. Whilst I would normally wait for sight of the full product, as that may still be some way in the future, for now I'll stick with the more simply-obtained digital download of what The Unknown describe as "a post atmospheric doom dark symphony". It may come as no surprise, with that sort of intention, that one of their major influences - and, in fact, previous collaborators - is Anathema, whilst Danny Cavanagh appears as one of the several guest musicians on this album. You do have to wait for the closing track for that to become especially relevant, however, with its 'We're Here Because We're Here'-era proggy guitar and piano workout. To begin with, if you were going to pick a musical comparator for the almost-Funeral opening instrumental, it'd be something more like The Howling Void's more ethereal and melodic moments. In between, it travels a logical enough progression that passes through a similar, longer, track with vocals, and into one dominated by more-or-less Dark Ambient textures. Perhaps the most concise summary would be that it's an album which gets steadily lighter and more hopeful as it unfolds. It makes sense, given that the underlying concept is one of humanity striking out to explore the possibilities of existence, to discover purpose beyond immediate gratification, and to become more enlightened and understanding of its place in the cosmos and the future. It does, however, mean that the doomiest moments are front-loaded, in the descriptions of the world as it is now, which fairly comfortably fits into a label of Atmospheric Doom, while the second half of the album is perhaps better classed as Post-Rock. It's a transition that's handled well enough: there's no obvious break to the flow, or contrived change of direction to the music to get it there. Impeccably orchestrated and mellifluous as it the music is, it simply drifts with an easy, airy familiarity through the various phases, the 'symphony' of the description reflecting that there is no real hard division between any of the four movements. Vocals only make two significant appearances, in parts 2 and 3. Both are clean male recitations, the first setting out the sorry state of earthbound history, the second more of an exhortation towards the stars. To give them credit where it's due: the clear intonation of the lyrics is almost spot-on, with effectively emotive use of inflection in their delivery. On the downside, they do fall on the verbose side, to the point where it's easy to lose track of the lengthy sentences, and - to a native English speaker, at least - some of the actual constructs and pronunciations - particularly in the longer 'part 2' speech - veer between quirkily odd and just plain wrong. Still, that's not something I'd consider a serious detraction from the listening experience: more of a feature than an issue. On that subject, I'd only have one real complaint - in both the choice and extent of sampled effects, used extensively to link the tracks together. And whilst I get how they fit into the narrative, such sounds as 'heart monitor', 'baby crying' and 'man weeping in rain' are all, by definition, not only intrusive and attention-demanding, but largely compel a response of wanting them to stop. Unfortunately, they're all dragged out way too long - well over a minute, in most cases - to the point where they simply becoming tedious as well as aggravating. 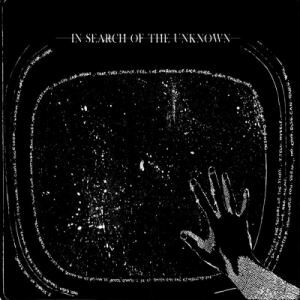 I don't want to be too harsh on 'In Search Of The Unknown', recognising its unique origins and the struggle to get it made at all. And in many ways, there's very little to criticise it for, assuming that you want a short, accessibly light, and often quite optimistic, keyboard-led piece to chill out with. In that, it succeeds admirably, and were I writing from anything other than a Doom perspective, I'd score it more highly. But, at the end of the day, it never delves much deeper than a lugubrious sorrow, emotionally, nor does it musically bring on any of the threatened heaviness from the opening few minutes. There are still plenty of Doom fans who've stuck with Anathema throughout their career, and The Unknown should find some favour amongst that cohort: for everyone else, it's unlikely to be a particular head-turner. Still, now that the precedent has been set, perhaps that will open the way for some welcome darker explorations, and I do have to especially commend the band for that particular achievement.